Why do we need to know as to how Indians spend time on the internet? How does that matter? We all know how internet marketing is gaining grounds and has become a crucial strategy for businesses. But to optimize various marketing channels you first need to know how people are using internet rather those channels or platforms, where are they spending most of their time. You may be working on your website optimization for desktops while your consumers are on mobile web. Of course if they say internet marketing rather digital marketing gives you the best ROI, its true but then only if you conduct things prudently. The first that you require is your customers’ information as to how they behave on web, where they spend most of their time and so on. • There are total 110 million mobile internet users in India of which 85 million belongs to the urban areas while 25 million belongs to the rural areas. Let’s take one of the stats for instance, i.e. 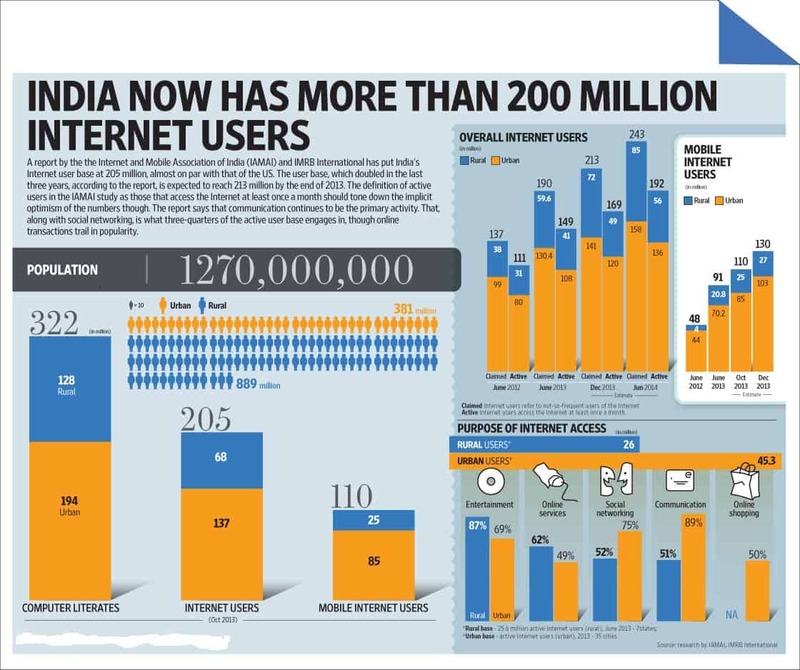 86% Indian web users visit a social networking site of which 33 million are twitter users, 90 million are Facebook users and 18 million are LinkedIn Users. The stats give a clear message to the marketers that a large part of consumers are on Facebook and that they need to leverage Facebook more than other channels to get more business. This was just one case , let’s take another stat for instance here i.e. of 205 million internet users 110 million browse internet on mobile making it clear for marketers that how crucial a mobile web marketing strategy has become for their business. In the same way, all other statistics have a message that marketers need to understand and take actions accordingly.